The Workflows module has been ported to Orchard Core, and it is awesome. In this post, I will give you a quick tour of the changes. I've always been a big fan of Orchard's Workflows module. From implementing straightforward email notifications, user registration and user login flows to more advanced content approval flows, Workflows has been super useful because it allows me to implement logic that could be changed at runtime, without having to do a new deployment. Business logic stored as data is a powerful capability of any platform, and the Workflows module written by Sebastien Ros is what made Orchard exactly that. With the advent of Orchard Core, a high performant platform that has been rewritten on ASP.NET Core, I took the opportunity to not only port the Workflows module, but to also improve upon it. I took Sebastien's work, adapted it to new paradigms introduced by Orchard Core, and made the module more robust, flexible and added new capabilities that enable more advanced workflows. Let's have a look at what's new and what's different. Although I thought that Workflows in O1 looked pretty good, the ported version looks even better. Other than an improved stylesheet, the new editor no longer has a toolbox with activities from which you can drag & drop activities. Instead, there's now an Activity Picker that lets you pick Tasks and Events (which are specialized types of an Activity). Because of this new design, it's easier than ever to read an activity's description as well as finding the activity you're looking for by means of the category filter and text filter. Rendering of activities on the editor's canvas has improved as well. In O1, an activity would most of the time simply display some icon and maybe a bit of text. In OC, many activities show more relevant details, making it easy to quickly understand what it does and how it is configured. Another improvement is the auto-resize feature of the canvas. In O1, the canvas had a fixed height. In OC, the canvas grows and shrinks automatically in height as you add or remove activities. Information is no longer passed in as a dictionary of tokens, but as a dictionary of already resolved objects. In addition to having input and properties (which are values provided by activities during workflow execution), a workflow now also has the notion of output. Output is a dictionary of values that are set by activities, and can be retrieved by the code that invoked the workflow. Although workflow output is not currently used by anything in OC, it does open up scenarios where for example a custom module let's the user define which workflow to execute to perform a calculation for example. Another use case is nested workflows, where a workflow can invoke another workflow, and receive its output and add it to its own set of properties. In O1, a workflow was tightly coupled to content items. In OC, a workflow can be associated with anything. This decoupling is achieved by replacing the Content ID property of a workflow with a Correlation ID. A Correlation ID can be any identifier to associate the workflow with. A typical example is a content item ID. When a content item is created for which a workflow has been defined that handles this event, the workflow is correlated to that content item ID. I took content ID as an example, but it's easy to imagine how this would work for other workflows that revolve around different types of entities. For example, you could have a custom module that provides CRM capabilities. Such a module could expose a Customer entity which is not implemented as a content item, but as a simple database record. Workflows can then be correlated to customer records. It is now possible to keep finished workflows for retroactive inspection. This might be useful not only to see how many times a workflow has executed, but also inspect individual workflow instances in detail. 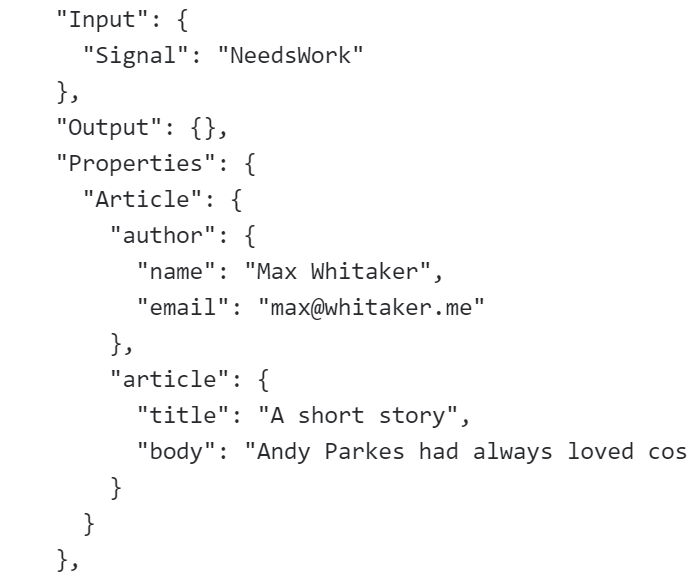 You will be able to see the full workflow state in the form of its JSON representation. Although not yet part of this early version, you'll also be able to see what path the workflow execution took, plus there will be a log trace available. By default, when a workflow is triggered, a new workflow instance will be created. Unless the workflow definition is configred to run as a Single Instance workflow. When that option is checked, the workflow manager will not spawn a new instance if there's already one that's not yet completed (or faulted). In O1, only one activity could be marked as the start activity. In OC, on the other hand, any number of activities can be marked as a start activity. This enables scenarios where you for example have two events. Triggering any of these events will cause your workflow to execute. Although the HTTP Redirect activity is not new, it does provide an additional option, which is the actual HTTP Status Code to return: 301 or 302. The HTTP Request task activity is an improved version of the Web Request activity from O1, and supports a wider range of content types to provide as the HTTP Content payload (which supports Liquid syntax) and more HTTP Methods. Additionally, the new version allows you to provide any number of HTTP status codes you wish to respond to. For example, if you enter "200, 404, 500", the activity will expose those 3 codes as outcomes. HTTP Request event activity is a brand new activity that executes whenever an HTTP request is made to your Orchard application on a specific route. This enables scenarios such as handling webhook events from some web service for example. For example, when something happens on a GitHub repository, GitHub can trigger your workflow, which can do things such as creating or updating content, sending emails, or even making an HTTP request back to GitHub to do something interesting there. The Filter Incoming HTTP Request activity behaves exactly like an MVC Action Filter - it is executed for every HTTP request made to your Orchard application matching a configurable route. For example, if you wanted to execute a certain workflow everytime a request is made to the "MyModule/Items/Values" route, this is the activity to start your workflow with. There is currently just one background activity, which is the Timer activity. Although this activity has the same name as the one in O1, the implemetation is based on a CRON expression. Today, you have to enter the CRON expresson manually, but there is a roadmap item to turn this input field into a flull-fledged CRON expression editor, which is much more user friendly. Until that is available, you can of course generate CRON expressions online. The complete set of available activities can be found in the module's documentation under the section called "Activities out of the box". Although the final set of out-of-box activities will take you a long way, it is to be expected that module developers will create their own, more specialized, set of activities. These activities can range from being general-purpose (and might be offered as NuGet packages) to being tailor-made to a specific problem domain. Whatever the case, activity development in Orchard Core is designed to be a breeze. Although implementing the actual Activity class itself remains largely similar to the way it's done in O1, implementing the activity editor and design views has changed significantly. Where you would use the Forms API in O1 to programatically define the activity editor form, in OC this is done via a display driver. In Orchard Core, the display driver system has been made generic, which means that we can reuse it for any kind of object we want to implement rendering for using shapes. Even if they are not content items, which is the case for workflow activities. Orchard Workflows is an incredibly powerful module that unlocks numerous advanced scenarios with its long-running workflow support. There's a lot you can do already with the out-of-box activities, and it's easy to create new ones using custom modules.